On Sunday, Cuppa and I were thwarted in our attempt to take a picnic lunch to the park by an antique car display which completely took over the whole place, at least to the point where there was absolutely no parking to be had. We thought of another spot that might suit: a grove of hackberry trees about a mile downstream from our usual spot. It's a small grove, but we had the place to ourselves and enjoyed our sandwich and time of contemplation. 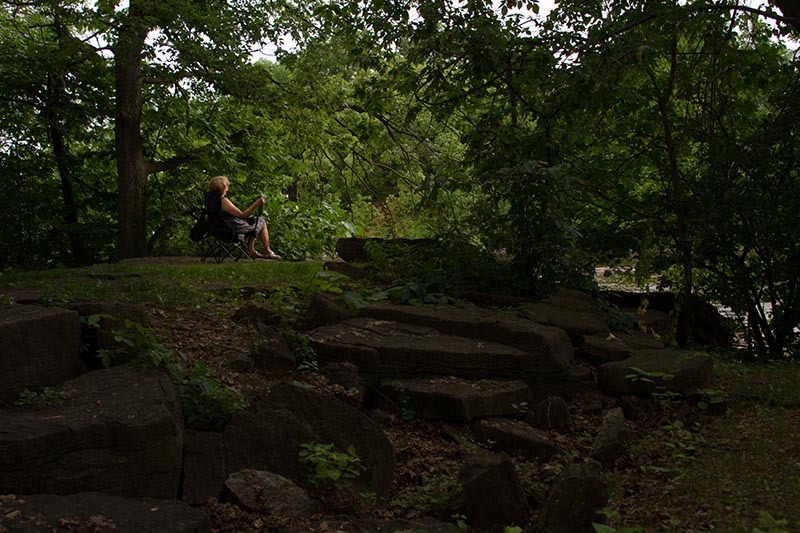 It was shady in the grove, but we found a clearing that overlooked the river and settled in for a relaxing hour or two. Hackberry trees are not terribly common north of Lake Erie, and this is perhaps the largest stand in the Ottawa Valley region. It is speculated that Native Canadians planted these trees for their medicinal berries at points where they might have to stop and portage. 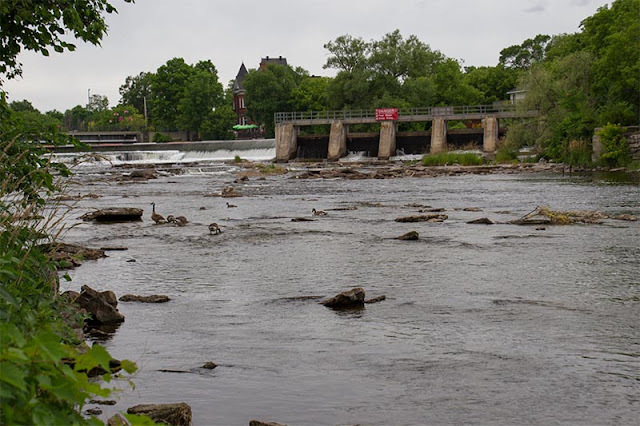 The river in this section is shallow with rapids and falls and is unnavigable. Even the geese can wade. 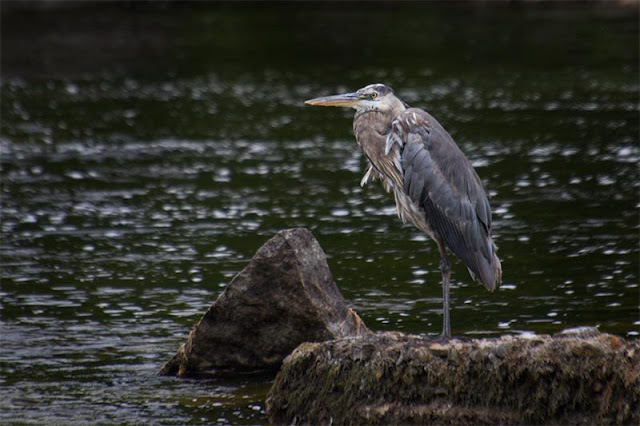 I spied a Great Blue Heron standing on a rock outcropping in the river. Apparently, he was moulting and looked quite dishevelled. Someday, I will get a good photo of a heron in prime condition although this guy does have character. This American Red Squirrel was cavorting around the grove. These red squirrels are almost as small as chipmunks, so we were uncertain which it was for awhile although I don't recall seeing chipmunks climb. It's just that I have never seen a Tamiasciurus hudsonicus in an urban area. 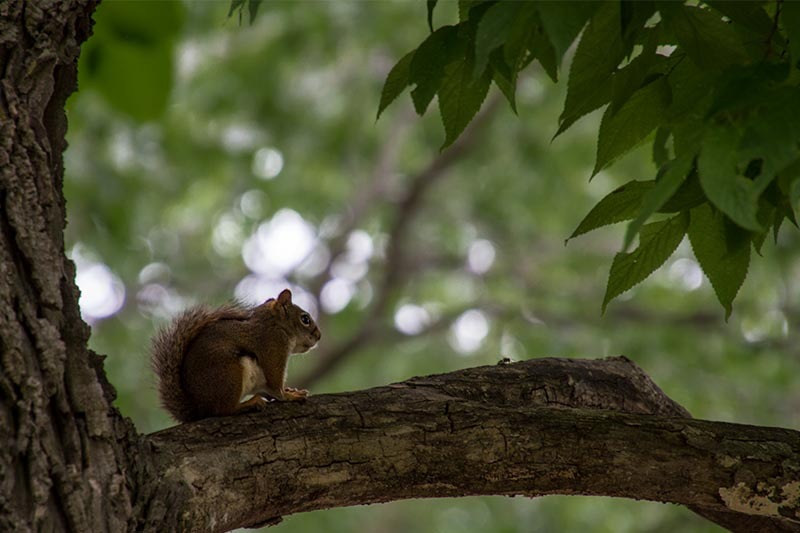 We always just see black/gray squirrels, the reds only usually inhabiting forested areas. These reds are smaller and quicker than their larger cousins, and this guy was bold enough to begin climbing aboard my foot. I wasn't too comfortable with that so I shooed (get it?) him away. Got it. AC is on. Lovely photos, especially Mr Red S. We have lots of them out here and I have even seen them drive a black away from the bird seed fallen from the feeders. You're lucky to have the river there as it gives the town a lot of character. The best heron shot I ever got was of one that was hanging around a dock where fishermen cleaned their catch. I'm not above baiting when I want a specific shot. Or if you can find a spot where they nest. There is one such on Highway 43 just as you leave Port Elmsley heading for Smiths Falls and that road is a nice drive. A bit late this year; most of the chicks are fledged and out. That could be a young adult just getting its adult feathers. LOVE the shots Ac! Beautifully done! I got it! That looked like a very pleasant spot A.C.
Oh! I enjoyed this post, AC! You live in a beautiful part of our world! that squirrel away when he was climbing around your foot! I just removed the worst and most arranged pun I ever wrote. You're welcome. looks like a wonderfully mixed air sort of spot to relax in. What a lovely shady spot by the river. I must admit I have never heard of Hackberry trees so you sent me googling. Thanks. Thanks for taking us along on your jaunts...it looks so peaceful. Looks like a perfect spot in which to have a picnic. I will have to look up hackberry--not a tree name I know. Looks like a lovely spot. I guess someone has been feeding the red squirrels around there, if he was that bold. They're usually quite skittish. Chipmunks do climb trees but seem to prefer to lay low. The best way to tell the difference between the red and the chippers is the tell-tale strips on the latter's back. Both are darn cute though. And a heron visit is always a treat.